Techniques for adding attributes to road sections are similar to the techniques for adding attributes to all items on YME. When you add attributes to roads, pay attention to how you assign attributes to road signs that are linked to intersections. By attributing a section of the road as well as the road as a whole (see Section 3.3.3. The rules for attributing roads). It is necessary to control for the consistency of the specified values. 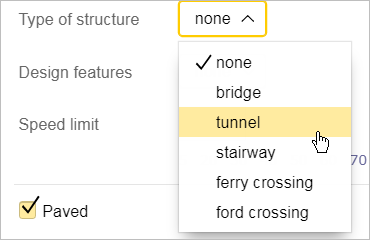 For example, if you enter Tunnel as the Type of structure for a section of road, then the Level A and Level B attributes should have negative values. All roads on the national map are classified by their significance in the transportation system: each road element is assigned a specific attribute value Class. 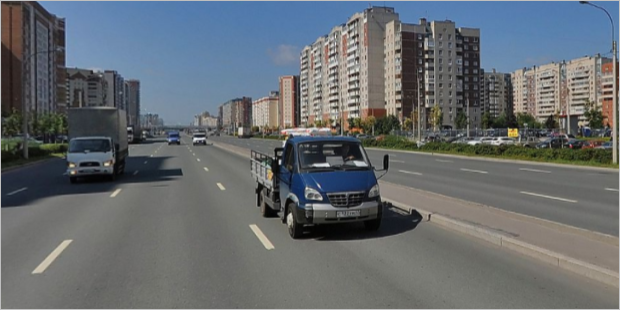 The road class is determined by the types and sizes of localities (and other important features) it connects, as well as by its role in shaping the connectivity of the road network. To a lesser extent, the road class defines its physical characteristics. However, the fact that a highway has an identification number does not affect its significance. This means that a narrow single-lane road connecting two cities will be assigned a higher class than a two-carriageway road with a median that connects districts within a single city. When selecting a road class, you must preserve how the road is connected to the network: each class of road should connect to roads of higher classes to form a united (connected) network. See point 3.3.1.1.1. In particular, keep this point in mind to avoid lowering a road's class in areas where it passes through localities (if there are no roads that circumvent those localities). Additionally, roads of a particular class should not be connected to the remaining road network exclusively by roads of a lower class. The connection to the network should happen via roads of the same or a higher class. Exceptions are only allowed for areas that are isolated from the main road network. When there are several roads of the same significance, select the main ones and the ones that are preferable for transit traffic. Assign those ones a higher class. This is particularly necessary in order to avoid assigning the same class to too many roads in city centers. At the exit from a high-class highway to a low-class one, enter the functional class of the lowest class highway for the connecting road or exit. Start from the point where it branches off (i.e. from the beginning of the turn or exit). At the entrance from a low-class highway to a high-class one, enter the functional class of the lowest class highway for the connecting road or exit up to the point where they join (i.e. from the beginning of the turn or exit). At the same time, at junctions and intersections of roads of three or more classes, a situation may arise when there are exits that are on the formal the attribute must be assigned to the same class, actually belong to another-this is where they should be assigned when mapping. Example 1. The intersection of road #1 (class 2), road #2 (class 5) and road #3 (class 6) is shown in the drawing. 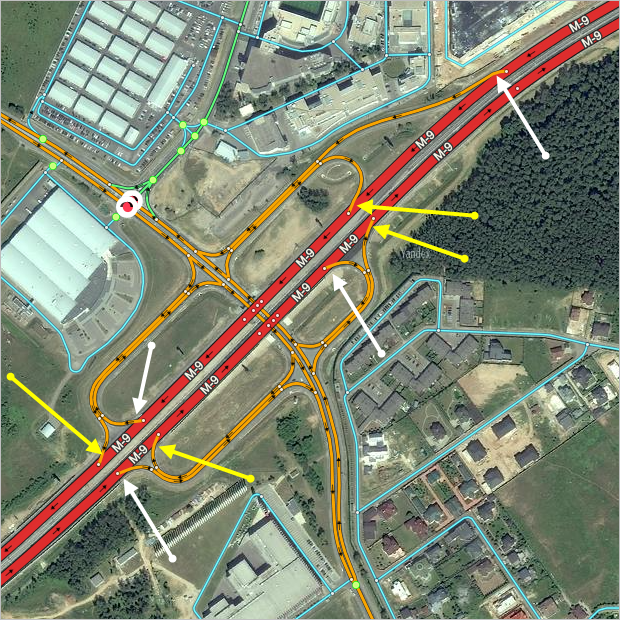 Exits #4, 5, 6 and 7 connect roads #1 and 2, so based on that formal characteristic and their position in the road network, the exits should be assigned the lowest class from among the classes of connecting roads — class 5. 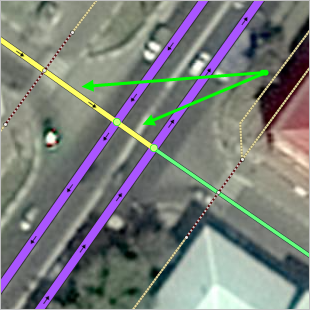 Example 2 A class-4 road passes through an intersection (purple in the drawing); two other roads cross the intersection: a class-6 road (yellow) and a class-7 road (green). b) Those marked with blue arrows connect class-6 and class-4 roads (the upper part provides passage from the class-4 road on the left and onto the class-6 road, the right part provides passage from the class-6 road up and onto the class-4 road). 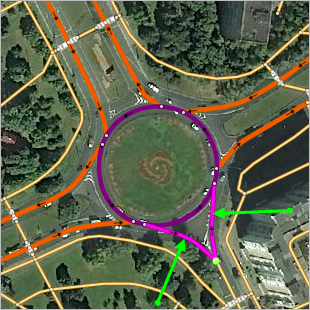 A circular road section will take the same class as the highest class road that intersects with it. Other than the road section class, roads are generally characterized as being a type of road, which is specified in the road editing panel. See Section 3.3.3.2. Type of road. National highways that have the official Freeway or Speedway status and inner-city rapid transit motorways form class 1. 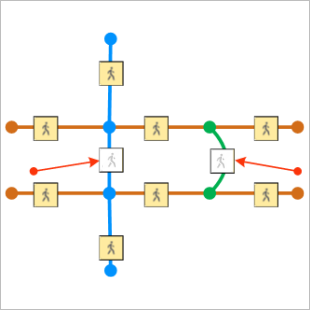 Roads of class 1 and 2 complement one another and should form a connected network. For example, the section of highway E-30 in Poland in the area of mińsk Mazowiecki. Motorways of national and international significance that form the main body of the road network in large and mid-size countries and are the main transit highways in small countries that connect the capitals (or major cities) of neighboring states form class 2. In large countries, this road network connects the administrative centers of second-level administrative divisions. In large countries, this type may also include major inter-regional roads that connect several centers of second-level administrative divisions. Roads that are part of transcontinental international highway networks belong to this class. In major cities and agglomerations, the most significant outbound roads also belong to this class. In sparsely populated, sprawling territories, this level also includes internal roads that are at least 150 km long. In widespread and sparsely populated areas: roads at least 50 km in length that connect 5-10 rural localities along with roads of higher classes or lead to townships with populations of at least 5,000. If a class 4 road ends within a locality, then it should lead to a central square, vehicle station, or a central intersections. Within localities, roads of this class may lead to popular transport, social, or cultural attractions of state significance. The roads are unpaved, leading to administrative centers third-level administrative units, belong to class 4 not follow. Key roads within third-level administrative divisions that were not assigned to a higher class form class 5. This class includes roads that are not urban and run through several small localities (or lead to one major locality) and connect the latter to roads of class 1-4. Within localities, roads of this type may lead to extremely popular transport, social, or cultural items of regional significance. In cities with populations greater than 100,000, class 5 roads include large transit streets that link neighboring parts of a city, and outbound highways that continue past the city as local roads leading to rural localities. In localities with populations of less than 100,000, class 5 include major transit roads through the city (when there are roads of class 1-4 that circumscribe the city). Outside of localities, this class includes roads that are not included in classes 1-5 and that lead to separate localities, rural settlements, and farmers co-ops (or groups of localities that are located in the same area). These roads are not connected to the main road network via roads of a higher class. In major rural developments (including farmers co-ops and rural (dacha) settlements) this class includes highways and roads that lead to extremely popular transport, social and cultural items of regional significance. In localities, class 6 roads include main streets that are set off from urban zones (districts, subdistricts or localities that are part of the city), secondary transit streets that are connected to neighboring areas of the city (such as exits from isolated city zones), and frontage roads with no less than three traffic lanes that run adjacent to highways of class 1-4 (see point 3.3.2.7.5). In small localities, this class is used to represent the main transit road when a road of class 1-5 that circumvents the city is present. If a road of that class ends in a locality, then it should lead to a central intersections. This class includes all local roads that have proper names and do not belong to class 1-6, but are technically suitable for motor traffic (even if traffic is prohibited or the street is labeled a pedestrian zone). It also includes unnamed passageways and intersections that handle the same traffic that the connecting roads do. 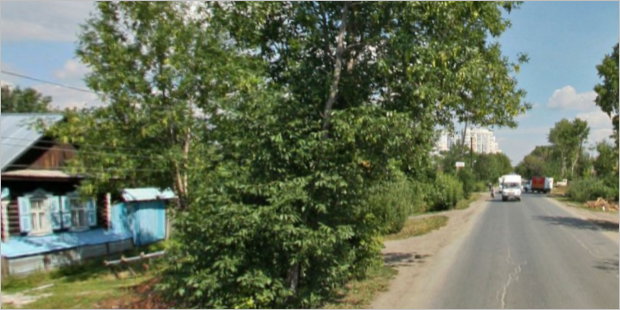 In rural localities and farming co-ops with unnamed streets, class 7 only includes the main roads in farming and rural (dacha) communities. Exceptions to this rule are major roads used to enter/exit or transit within multistory blocks that cover a large area (including unnamed streets), and main roads on major cemetery grounds. Class-7 streets are comprised of pedestrian streets (e.g. Arbat St. in Moscow, Bolshaya Pokrovskaya St. in Nizhniy Novgorod, Vana-Posti St. in Tallin). Usually, car entry is prohibited with signs such as “No entry”, “Pedestrian zone”, or “Bicycle lane with shared pedestrian traffic” (“shared lane markings”). In rarest cases, it can be a “No traffic” sign. These streets should have the accessible to pedestrians and cyclists only attribute. This class also includes central alleys and streets in large pedestrian zones (e.g. parks, cultural monuments, sports-related items, and other recreation areas) that make up the backbone of their corresponding road networks and connect the main entries to pedestrian areas. Such roads should be clearly distinguished from the larger pedestrian area network, and must be suitable for specialized vehicles to travel through. Enter the accessible to pedestrians and bicyclists attribute for these roads. Outside of cities, class 7 roads include paved roads leading to small localities and farming co-ops that are between 1-5 km in length, as well as re-enforced dirt, forest, or field roads (including those that run through shallow riverbeds), and winter roads that are the main or preferred route to a rural locality or a farming co-op. At least one road of this class or higher should lead to every populated locality. Outside of localities, class 7 includes paved roads that lead to transport-related structures and agricultural items, recreational areas, camps for children, local attractions, and networks of technological paved roads within broad industrial areas or territories. Additionally, this class includes all trails at major ski resorts that are located within developed areas of localities (like Bukovel and Roza-Khutor) as well as tracks at major car-racing facilities (such as the Formula 1 racing tracks). Class 7 also includes all roads that are under construction (other than class 10 roads — pedestrian and bike paths) and some frontage roads (see point 3.3.2.7.5). 3) Roads on closed territories: within industrial zones, on the territories of organizations and institutions such as hospitals, hotels, resorts, recreation and wellness centers, etc. 5) Pieces of secondary named roads on the territories of individual developments (including farming co-ops). 7) Tracks at medium and small race car, go cart, and motorcycle racing complexes. This class is typically found in localities. If they are found outside of localities, it is generally only in the cases described in points 3 and 4. Class 8 roads do not have names. 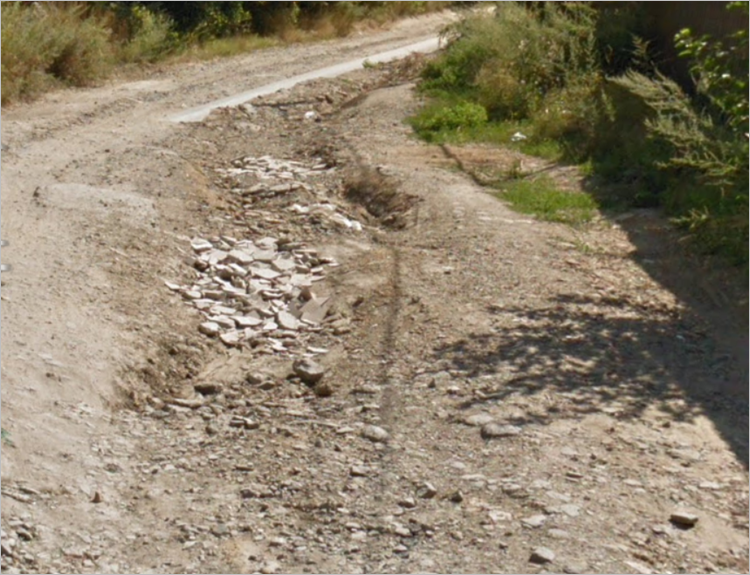 Forest and field unpaved roads (not received a higher class). In most cases, this class includes insignificant exits from the locality to another locality or to the depth of an unsettled area. Roads in this class are not commonly found within the borders of localities (with the exception of areas that are not very developed, but are nevertheless parts of localities). Roads that belong to this class do not have names and are not paved. If the road network consists of sections of a class-9 road and all entrances are blocked or have restricted access signs, then mark the roads in that network as accessible to bicyclists and pedestrians only. This class comprises roads that can not physically support vehicles (or traffic laws prohibit vehicle passage on them). This includes sidewalks; pedestrian roads through parks or cemeteries, within building blocks, or over railways or motorways; staircases, pedestrian bridges and tunnels, and named streets that can not physically be traversed by vehicle (if, for example, they are narrow paved paths). Additionally, this class includes running tracks at stadiums and sports complexes, equipped ski trails at skiing and biathlon stadiums, and all ski paths within developed areas of localities. 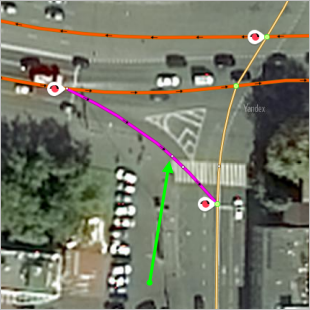 Use the “Pedestrian crosswalks” and Design features attributes for Pedestrian crosswalks. 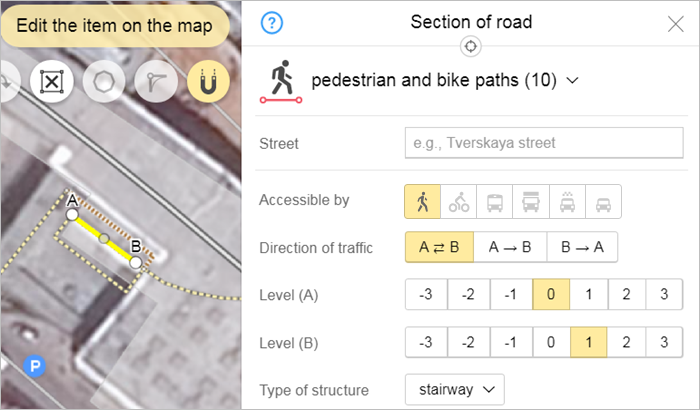 Assign significant pedestrian paths (such as Arbat St. in Moscow) to class 7 rather than class 10 (see point 3.3.2.1.7). See also Color-coding by road type. The panel Street field is used to specify the name of the street (road), which includes the shaded area. The name shows what road the section belongs to. Don't fill out this field for roads of class 8-9. When you fill in the field, keep in mind that streets often partially overlap with each other, so a specific section of road may simultaneously belong to several roads with different names. For example, Begovaya St. in Moscow is also part of the Third Transport Circle. In these cases, you can add the appropriate number of attribute values after you enter the first value. If the street is already on the map, then select its name from the list of suggestions. If the street is not on the map, you must fill in this field manually: enter a name for the new road and it will be created. When you enter road names, follow the Rules for naming roads (see point 3.3.3.3. Name of road). Clicking this link opens the panel for viewing and editing the road attributes, including its composition (for more information, see 3.3.3. Rules for attributing roads). For information on setting the “Part of” attribute, also see point 3.3.3.3.3.9; and for sections of road at intersections — point 3.3.1.5.3.5. In the field “Available for” sets the accessibility of the road element for vehicles (vehicles) and pedestrians. The attribute value is determined by whether it is possible to travel on a road element on different types of vehicles (TS), or to walk on it. Whether a vehicle can be used for transportation or not is decided based on driving regulations and traffic signs rather than a vehicle's actual capacity to drive through a location (except for public transport or bicycles). The available values convey whether the road is accessible to pedestrians, bicyclists, public transport, trucks, and/or light vehicles. Only use the “Pedestrian” attribute when dealing with crossings. You must “use” the Pedestrian value if there is no sidewalk along the motorway, but pedestrians can still walk along the shoulder. If the roadway is class 1 (Freeways). If the road is class 2-7 and it's not physically possible for pedestrians to walk along it (because there is no sidewalk or road shoulder, such as in zones of development). If there is a sidewalk drawn along one side of the road section, and on the other side there is no sidewalk or curb accessible to pedestrians (see Cl. 3.3.1.6.3. Sidewalks). 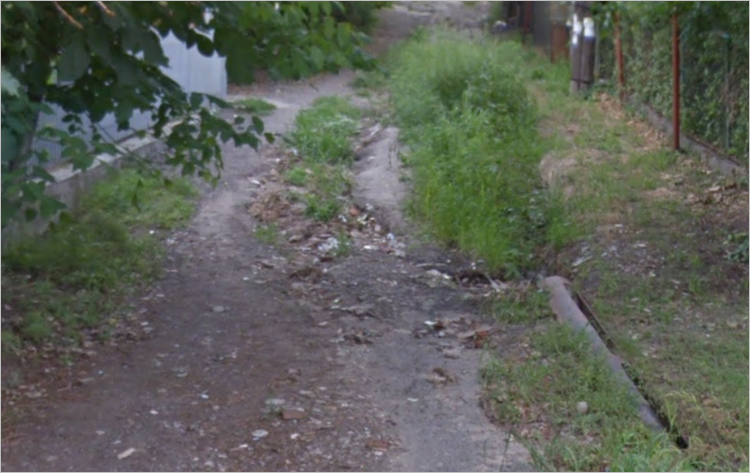 If there are sidewalks that have been drawn along both sides of the road section (see Cl. 3.3.1.6.3. Sidewalks). Use the pedestrian access value for roads of class 8, even if a sidewalk is drawn along it. If pedestrians can only access class 7 roads (for example, private roads), then use the pedestrian access value for the roads in question (even in the case described in the example above). Road sections adult cyclists can drive through in accordance with traffic rules must have the “Bicycle” attribute. However, the “Bicycle” attribute is disabled for class-9 and class-10 roads in cases where the route is impossible or very difficult to travel through on a bicycle. The rules for setting accessibility values for sections of road that bicyclists can use may differ by country (in accordance with local traffic laws). For dedicated bike paths (see Cl. 3.3.1.6.5. 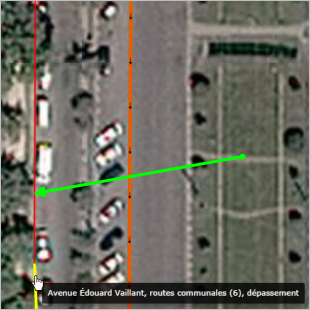 Bicycle paths)Only indicate the value of this attribute. Furthermore, don't mark bike paths that run parallel to vehicle or pedestrians roads as accessible. If a pedestrian crosswalk or stairway has a ramp that is accessible on a bicycle, set the attribute value. Use the “Public transport” value for all roads of class 1-7. 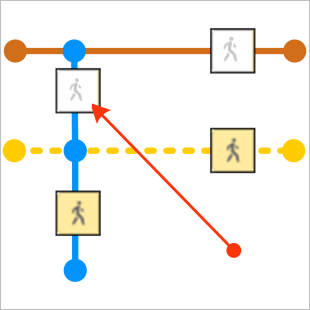 Accessibility for public transport (FROM) on the roads of classes 1-7 can be removed in exceptional cases when this is necessary for the correct operation of the route threads from. To remove availability FROM is allowed only to users who have rights to work with the route threads FROM (see 3.14.3. Rules for creating and attributing the route options for public transport). Don't use“ the ”Public transport value for any roads of class 8-10 except for sections that are used for public transport routes (such as traffic circles at ending stops). Also “don't use” the Public transport value for any of the roads indicated under point 3.3.2.3.6. 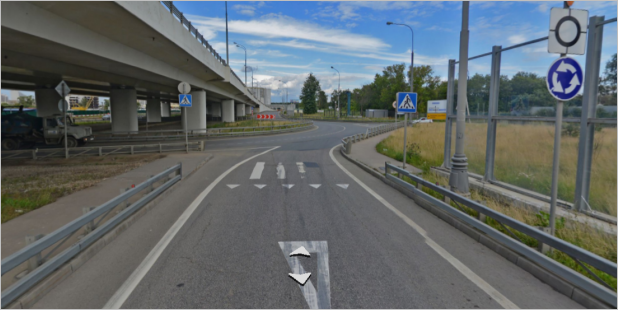 When specifying the attribute values for road sections with “Cars are prohibited”, “Do not enter” road signs, you should indicate Cl. 3.3.1.7. Rules for drawing road barriers. For ski tracks, running paths, and other such items, you must use the “Pedestrian” value exclusively. For runs racing tracks, motorcycle racing tracks and other similar facilities necessary to turn off all attribute values. Enter the “Traffic allowed in both directions” value for pedestrian and bike paths. Athletic tracks where traffic is set to move permanently in one direction year-round (such as on ski paths, bike tracks, etc.). 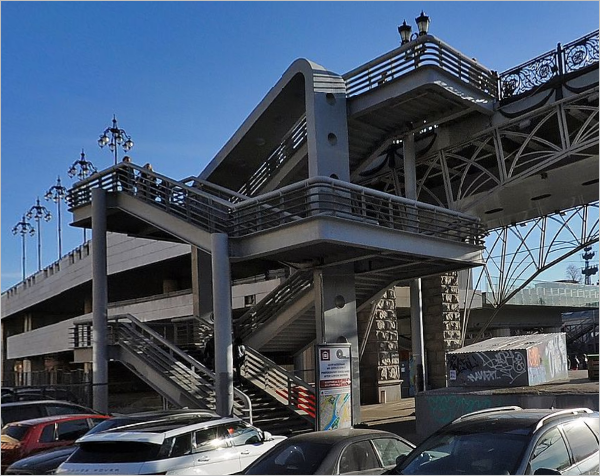 Entrances and exits to the most popular cultural, social, and transport-related map items (where the entrances and exits are clearly demarcated for traffic going in one direction, such as at the Moscow Kremlin). 0 (ground level) — if sections of road that intersect are both on ground level. For example, at intersections or railway crossings. 1, 2, 3 — above ground level. For example, if one road at an intersection passes over another on a bridge or as part of an interchange and the second road or railway is at ground level. -1, -2, -3 — below ground level. For example, if one road at an intersection passes through a tunnel and the second road is at ground level. Values “Level And” and “Level B” must be filled in for each road section. 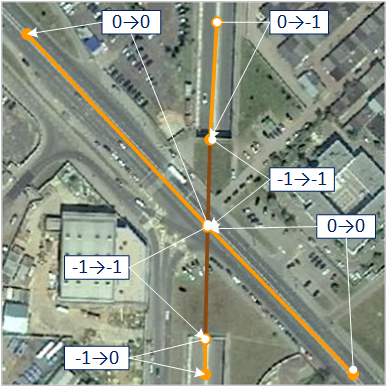 If the intersecting roads intersect on the same level, at the intersection point, the road elements must have the same level values. 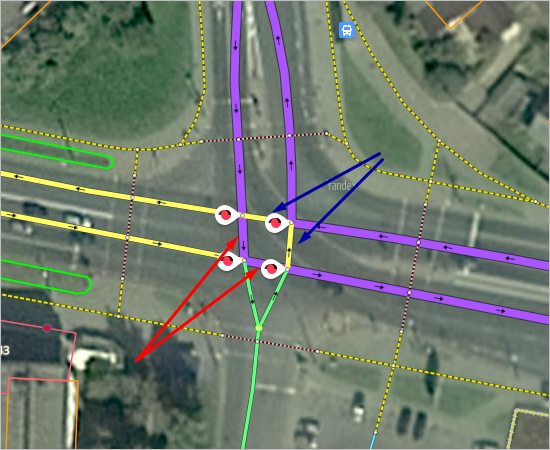 If roads intersect in the plan but are located at different heights, these road elements must have different levels at the intersection (in the plan). A road consisting of several road sections should be logically connected to the correctly spaced values of “Level A” and “Level B” for all road sections that belong to it (see Leveling examples). The majority of road sections have a zero value for “Level A” and “Level B”. You can only change the values of road levels (including pedestrian paths) if they pass through tunnels or over bridges. In exceptional cases, the value may also change for roads in underground parking structures (see point 3.3.1.1.6.1). If the road follows the local terrain and thus, for example, rises along with a slope or falls along with a valley, then this does not affect the value of the road level. 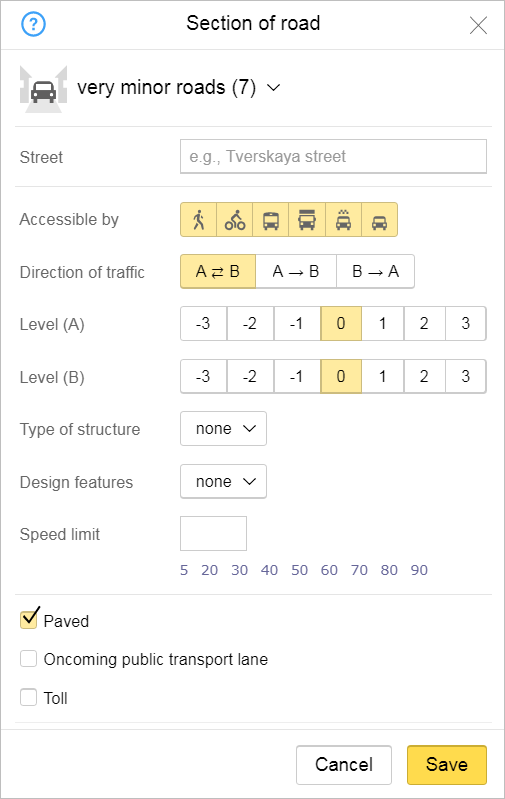 Road sections can not have values for Level A and Level B that differ by more than one. If there is a difference of 2 or more, there is an error in the allocation of the road element and it must be divided into two (or more) sections. Descents and ascents into and out of above/below ground pedestrian crosswalks are marked using levels (similarly to how different types of road sections are marked). 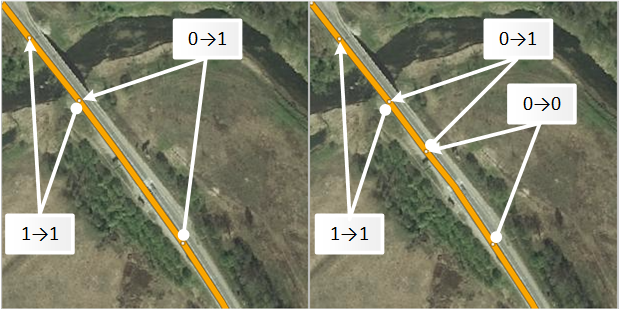 The sections of road that approach a bridge and have the values [0—1] or [1—0] for levels A and B should not be longer than the length of the bridge itself. If a section of road that is the same length as the bridge itself doesn't include a single intersection with other roads, then you must create an additional point on the road in order to lower its level. 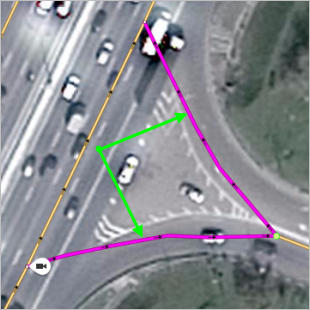 d) See the Examples of setting road levels at interchanges section for more information. It is necessary to strictly observe the connectivity of the routing graph (see para. Connectivity): attribute value “Level And” and “Level B” they should be changed not only for sections of roads in a tunnel or on a bridge, but also for sections adjacent to them. Otherwise the road graph will be disconnected. 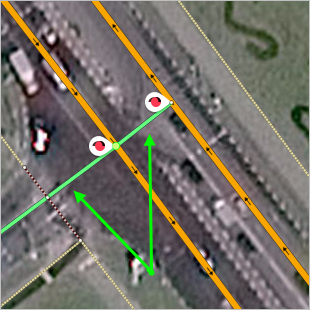 For logical breaks in the road graph (as a result of incorrectly set levels), it is not possible to construct a route that passes through the section of the gap. The roads passing over bridges on the national map include the roads that are located on bridges (underpasses, overpasses) across rivers, roads, ravines, or other physical obstacles. 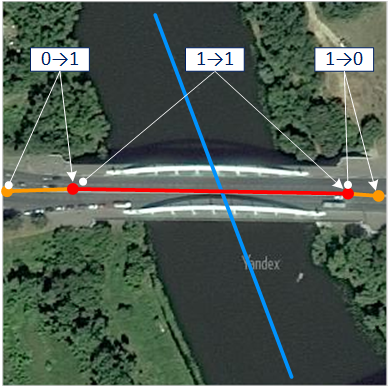 For information on bridge boundaries, see point 3.8.1.1.3. Or (in developed areas and/or in interchanges) the road level continuously lowers in relation to the ground level until it reaches the entrance portal to a tunnel. 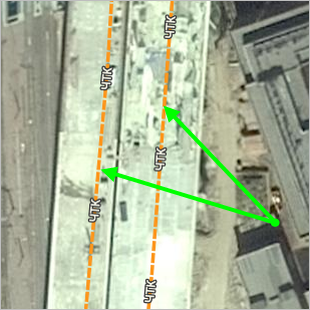 The presence of entrance or exit portals: these are considered to be the boundaries between the tunnel and the section of road with the “tunnel” attribute. Draw the part of road that runs through the structure as a separate section of road (regardless of whether the road is drawn using one or two lines). Enter the beginning and ending points for these road sections at the points of entry and exit to the road structure: the points where the bridge connects to the ground (don't include the embankment part of the bridge) and the portals to the tunnel. Underground and aboveground pedestrian crosswalks are marked with attribute values. Road structures that consist of pipes and dirt embankments that water flows through beneath the road. Parts of the road that run under arches in residential buildings. Use the Staircase attribute in the situations described below. 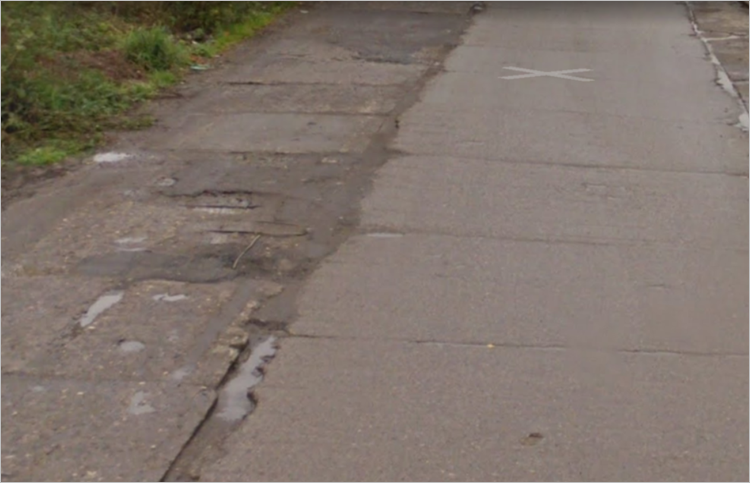 You can link address points to this type of road. If a stairway is equipped with a ramp, bicyclists can access that road section. 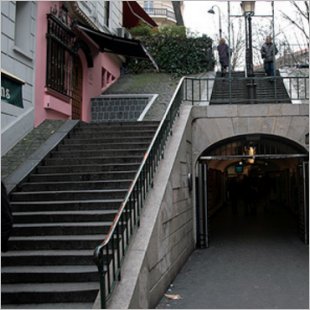 Stairs for underground and above-ground crossings. The "Ford" value is assigned to an attribute on road elements that intersect a small area in a river or stream (which can be reached on foot or by car). A road section's class must be the same as all the adjacent road sections. Disable the paved attribute and enable the disrepair attribute. Select an attribute value from the drop-down list. 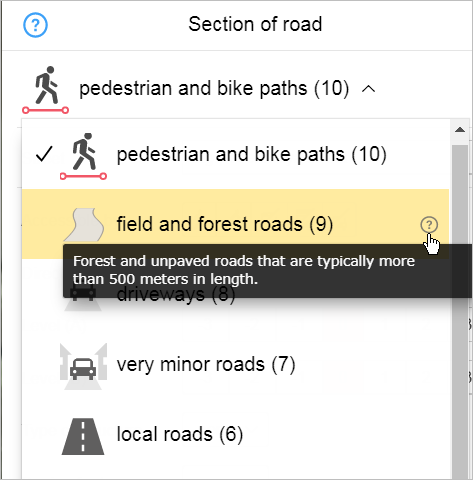 For road sections that don't have any of the design features listed below (i.e. they consist of one roadway, etc.) Default value. For road sections, which are drawn in two arcs in accordance with the rules, see Section3.3.1.2. Rules for drawing roads in one/two arcs (one or two lines). 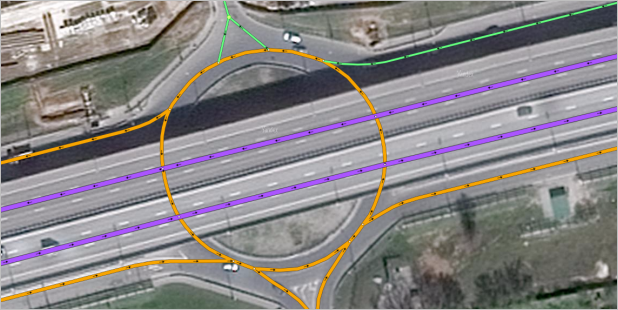 There is a tool for drawing circular road sections. Assign class 6 to frontage roads that are at least three-lanes wide and run parallel to highways of class 1-4, as well as to frontage roads that are 1-2 lanes wide and connect roads of class 1-6 to roads of class 6. Assign class 7 to frontage roads that are 1-2 lanes wide and run parallel to roads of class 1-7. Furthermore, that section of road should not be a continuation of a road of class 1-7. Sections of road that are intended solely as pedestrian road or railway crossings: underground, ground-level, and aboveground crossings (including descents and ascents). These areas are assigned a class value of10. Pedestrian paths. If a cyclist doesn't have to dismount when passing a bicycle crossing, then it doesn't need the “pedestrian crossing” attribute. 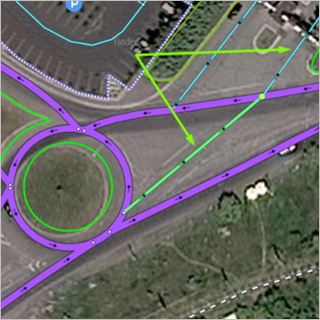 When mapping underground and aboveground crossings, keep in mind that they are not only drawn as road sections, but also as Road infrastructure items. Enter the speed limit attribute for that section (in km/h or m/hr). If speed is measured in miles per hour in the country you are mapping, then enter that attribute value in miles per hour (not kilometers per hour). You can enter typical speed limits by clicking on the appropriate value below the field (5, ..., 90). If the value you are looking for is not there, you can enter it using your keyboard. Do not enter a speed limit for field roads (class 9) or pedestrian and biking paths (class 10). If the speed limit is only in effect during nights, don't enter it. When you create a new section of road, the attribute value will be entered automatically. 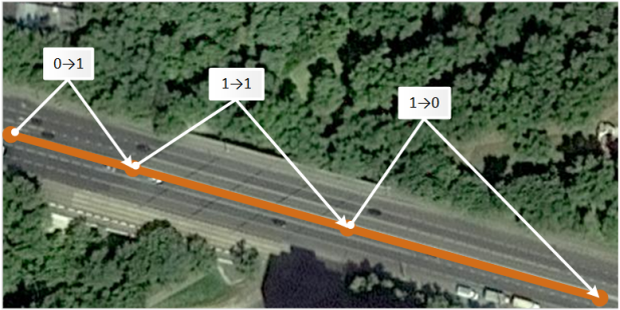 If a different speed limit is in effect on that road section, then you should correct the default value. The default attribute values are listed in the table (NP — settlement, class — attribute 3.3.2.1. Class). If a road section partially crosses the border of a locality (but also exits the border of that territory), then assign that section the lesser of the speed limits in effect on the territory it occupies. See also Road color-coding by speed limit. You can enter this attribute for any section of road (other than pedestrian and bike paths) on which a speed limit is in effect (whether it applies to that locality or is specific to that highway) or corresponding traffic signs are present. The locations of road signs for the Beginning and Ending of a locality (and the points where the speed limit changes) often do not coincide with the administrative borders of a localities. In cases where signs (construction, detour, etc.) indicate that the speed limit has been temporarily lowered, enter the attribute value that corresponds to the permanent signs or traffic laws. If signs indicate that the speed limit on the same road section differs by time of day, enter the lesser of the two values for the attribute. If two sections of a one-line road have differing speed limits for different lanes or directions, the attribute is assigned the lowest of those values. If a road section has differing speed limits for different modes of transport, the attribute is assigned the passenger car limit. 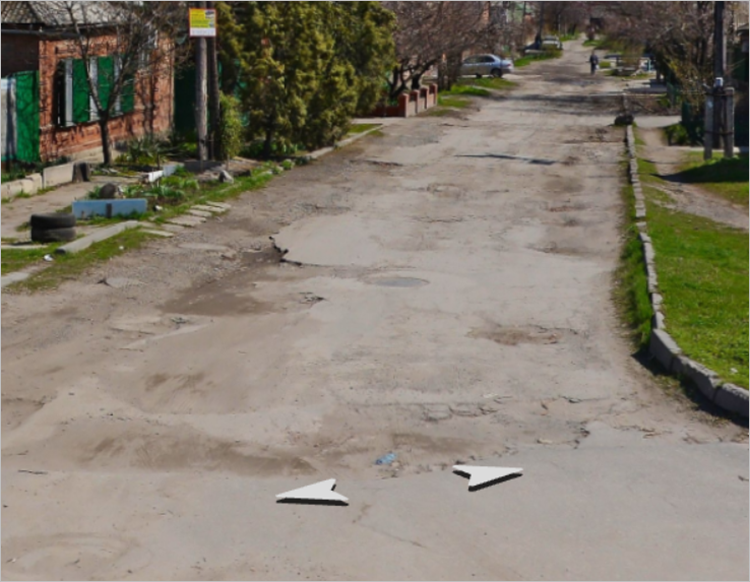 Flip the “Paved” switch on if a road section is paved using asphalt, concrete or paving stones (such as on Barrikadnaya St. in Moscow). Wooden covering, gravel, or crushed stone coating are not considered types of pavement. 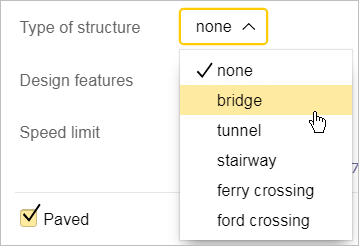 For ferry crossings, the attribute's value should be set to “Yes” (checkbox selected). The “Oncoming lane for public transport” attribute indicates that there is a traffic lane specifically allocated for public transport going in the opposite direction (on one-way streets). Value of the “Yes” sign may be assigned only for one-way road sections (See Cl. 3.3.2.4. Direction of traffic) without lane markers. The “Under construction” switch lets you show that a road section is under construction. Setting the value “Yes” this attribute should also be set to “Unavailable” for all modes of transport (see attribute description 3.3.2.3. Accessible to). During road construction and repair, the "under construction" sign is set if the traffic is blocked for a certain period of time. more than three months. Please indicate information about temporary closures in your map item report. You can draw a road that is “under construction” from the moment it starts being built (i.e. from the moment the foundation is laid). 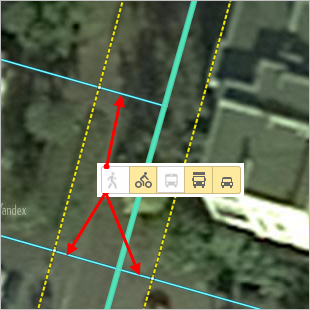 If a planned street already has addresses even though there are no buildings on it or sections that are under construction, you can draw the planned location of the road sections that are “under construction”. When drawing roads under construction, follow the rules for connecting the road network. 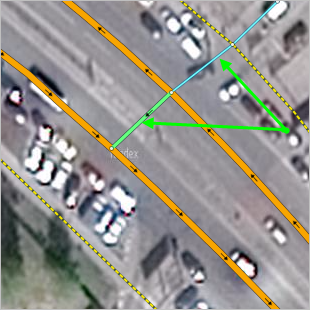 When you mark roads of class 6 and higher as “under construction”, you must raise the class of the road being used as a detour so that no breaks in the network of high-class roads occur. All roads under construction (except for class 10 roads) are class 7. Class 10 roads under construction (pedestrian) will still be class 10 (see also point 3.3.2.1.7). The rules for naming roads that are under construction are similar to the naming rules for all roads (see Section3.3.3.1. Rules for the generation of road names). The “Toll” attribute marks sections of road that you must pay to use. For highways that are partly or completely tollways, you should create an additional road item of the named highway type. All toll sections of a highway are included in one item, even if there are breaks between the toll sections of a highway (i.e. freeway sections). Enter names using the format М-4 (paid) — number + indication (in parentheses) “toll”. For sections of toll roads, set the value to “Yes” (check the box). For all other road sections, you can set the value to “No” (don't check the box). “Enter” the Yes value for all sections of road where tolls are collected according to official documentation (for example, the sections of the M-3 road between km 124 and 173), as well as sections of road that only exit onto toll roads sections. 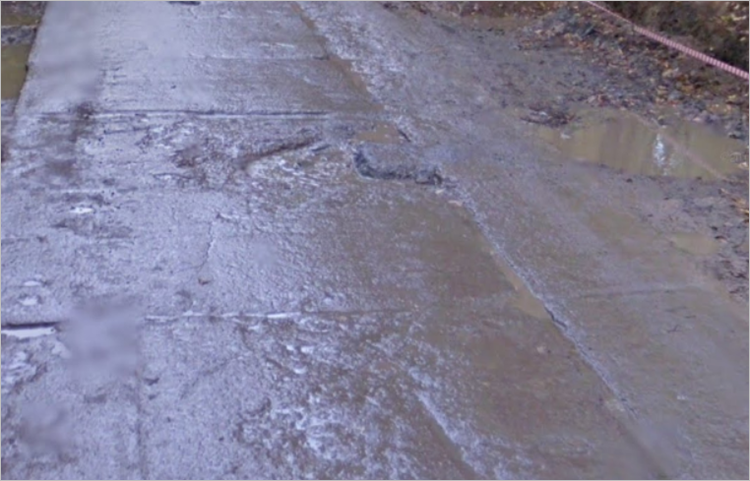 The “Poor condition” switch lets you show that a road section is in unsatisfactory condition. 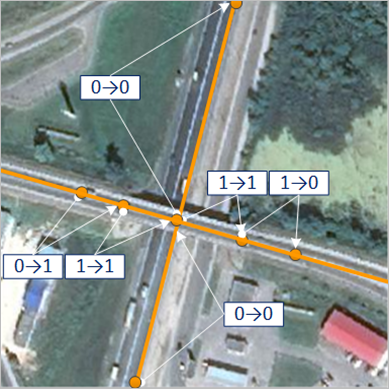 This attribute must also be enabled for all road sections with the Ford “structure type”. This attribute is only set for roads in classes 1-9. If the “No” value is set for a road section to indicate that it's not paved, then only set the “Yes” value for the “Poor condition” option in cases where it's not possible to drive through that section in a passenger car in dry weather. 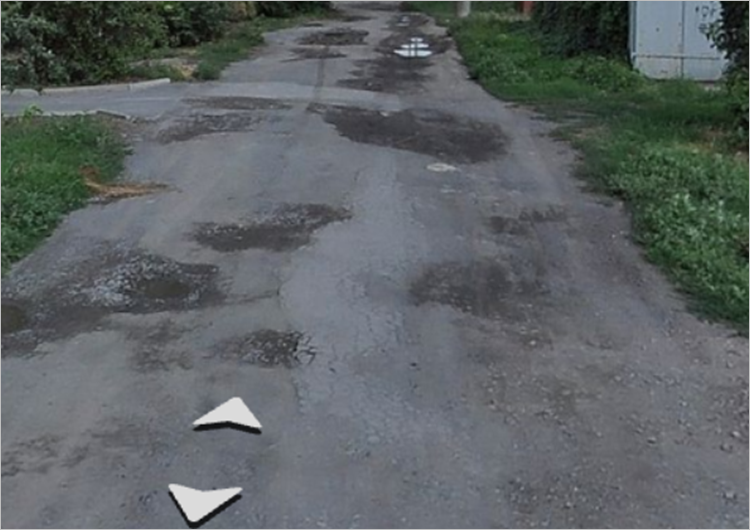 If the “Yes” value is set for a road section to indicate that it's paved, then only set the “Yes” value for the “Poor condition” option if there are potholes that you can't drive around. If a road is made of concrete slabs, then set this value if large openings have formed between the blocks or if the blocks themselves have been destroyed, potholes have formed, and the reinforcement bars are exposed. 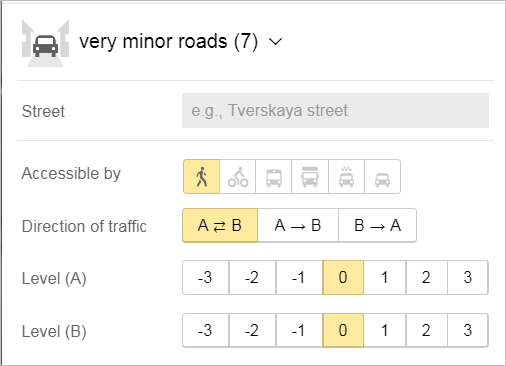 You should only change this attribute value if the section of road that the condition applies to extends for at least one city block or 200 meters. 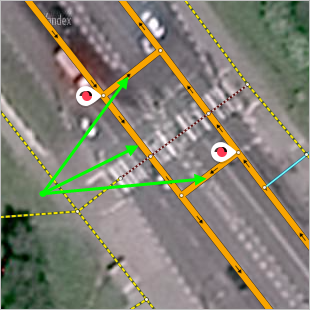 If the road section extends for less than that distance, then don't change the attribute value. 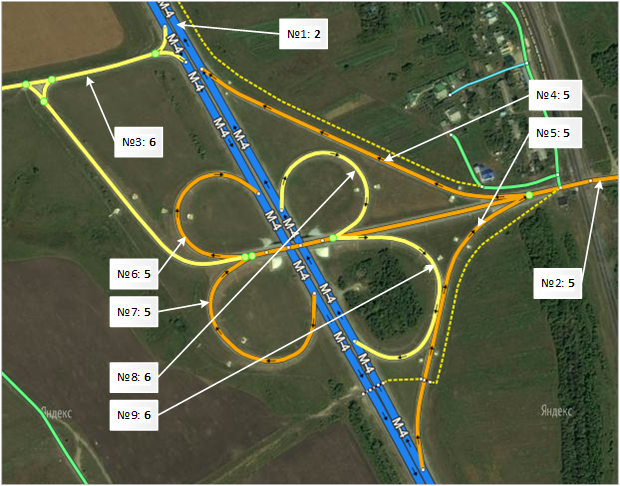 Don't create additional road sections within localities in order to assign attributes to them (i.e. don't break up road sections).